A couple of months ago, I wrote about Shaanxi Tasty Food, stall 27 in Super HK Food Court, 37-11 Main St, Flushing, in the basement of Super HK Supermarket. Shaanxi Province is in the northwest region of China and “tasty” describes the cuisine precisely. In that post, I raved unabashedly about their Oil Spill Noodle, aka Oil Splashed Noodle, so when my dining buddies and I were in the neighborhood the other night and about to embark on our second of three dinners (long story), it was a clear choice. 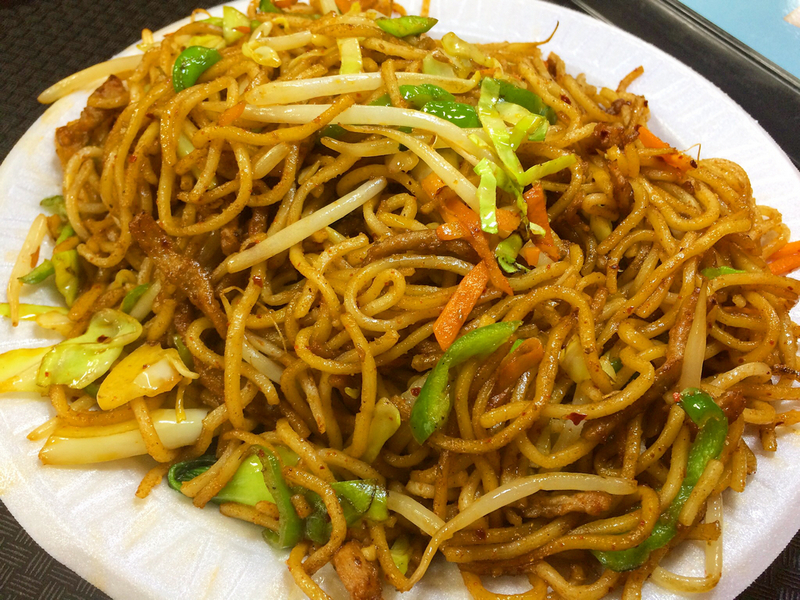 This time, we opted for the Cumin Fried Noodles with Beef (C3 on the menu, also available with chicken) and it was another hit. Now and then I have a taste for noodles that aren’t slathered in sauce or swimming in soup. These are dry – in the best sense – boasting a perfect chew, redolent of cumin, touched with a toss of bean sprouts, scallion and carrots plus a little kick from green pepper. More to come from Super HK Food Court….